Home » Media » That’s My Signed Photo! 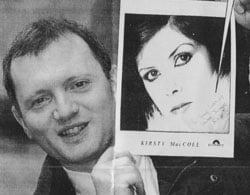 A bizarre twist of fate has reunited music fan Tony Cowdrill with a picture signed for him by the late pop star Kirsty MacColl 20 years ago. 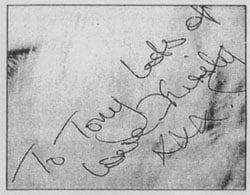 The photograph, carrying the message “To Tony, Love Kirsty”, never reached him in 1981 because it went missing before he had a chance to collect it. By chance, Tony heard from a friend that it had shown up on the internet auction web site eBay and was about to go under the hammer. The 37-year-old had just an hour and a half to get to a computer, log on and stop the precious item of memorabilia being sold to a rival fan.